Government, like the private sector, is now beginning to tap into and deploy the resources of organizations and individuals in other sectors to develop and create innovations, such as new ways to deliver public services. In the private sector, the once predominant and rather costly model of innovation involved each company having its own in-house R&D laboratory filled with researchers who were employees. In recent years, this has changed dramatically. Many companies are now reaching out for good ideas from across the world-creating "idea contests" or using social networking technologies, such as posting problems on the Internet and asking experts to submit solutions. In this report, Nambisan describes how Staples holds idea contests, called Invention Quests, in which independent inventors are invited to submit their ideas to Staples. Winning ideas are then commercialized by Staples under its brand name, with the inventor receiving royalties. Government's challenge is to learn from similar private and nonprofit sector experiences, developing new ways to move beyond the boundaries of individual government agencies and find innovative ideas in what may have been, until today, the least likely of places. 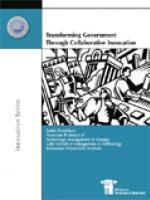 This report provides a guidebook for government on ways to reach out.